Welcome to Boating License Canada, your number one resource to take your Boater Exam® and obtain your Pleasure Craft Operator Card, commonly referred to as a Boating License. As of September 15th, 2009 all Canadian boaters and pleasure craft operators require a Pleasure Craft Operator Card or proof of competency in order to avoid expensive fines on the water. Successful completion of the Boater Exam® will grant you a Pleasure Craft Operator Card which allows you to legally operate a pleasure craft on all of Canada’s fantastic waterways. The Boater Exam® can be taken online and a temporary card printed as soon as you pass. Avoid expensive fines and get your boating license today! The Boater Exam® is mandatory for all pleasure craft operators on Canada’s waterways. 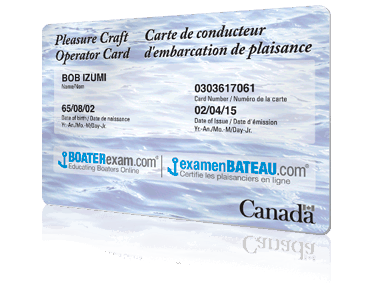 To avoid the $250 fine, simply complete the Boater Exam® online and obtain your Pleasure Craft Operators card today. Get the pleasure craft operator card !